We all know the glass bottles that we buy our drinks in and the glasses we drink from, but what exactly is this miracle object, what is its history, and how is it made? The Roman history Pliny (AD 23-79) recorded that Phoenician merchants traveling in the region of Syria accidentally discovered glass by witnessing a combination of natural substances catch fire in their cooking fire, in the era of 5000 BC. But historians of today date objects found in Egypt and Eastern Mesopotamia from 3000 BC, roughly the time of the Bronze Age, as our first evidence of man-made glass. These vases and pots had an opaque glass glaze on, which were early experiments! Currently, glass is manufactured from a mixture of sand, soda ash, limestone, and some additives. All these components are heated to a general temperature of 1600 Celsius in large furnaces, which produces molten glass – essentially the liquid form. This is then rapidly cooled, and poured around moulds to create the bottles, glasses, and sundry other items we take for granted every day. Glass is one of the least potentially toxic waste products that we produce. The raw materials it is composed of are cheap and relatively available, although they do need to be quarried, which has environmental implications. Glass will not decompose in a landfill site, but it will not leach toxic chemicals. The chief issue with glass production, and the benefit of recycling it, is the energy needed to run and maintain the huge furnaces, and to a lesser degree, the energy of transporting the raw materials and the product. Unlike other materials we examine on this site, glass can be melted down and reformed again continually with little or no loss to its quality. There are no waste or by-products from this process, and as the furnaces are in place, it is just the collection and breaking down process that is necessary. Crushed glass is known as cullet. This is passed through a magnet, which removes any traces of metal, at several stages of the process, from recycling collection point, through crushing, and before the heating point, the glass will be screened for metals or other waste products. A pure glass product must be collected, otherwise impurities will be captured within the new recycled glass – and manufacturers then wouldn't use the product! Glass is only 2% of the total volume of the average UK household, but it does account for about 8% of the weight of the total solid waste annually across the UK. 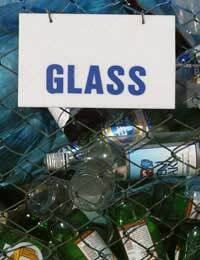 Recycling glass saves approximately 50% of the energy required to produce new glass. This is because recycled glass, in the form of cullet, needs a slightly lower temperature to melt it. This lower temperature has the added benefit of prolonging the life of the furnaces – perhaps by up to 20 years. Each ton of recycled glass reduces mining waste by 230 kilograms, thus preserving the environment and saving energy. How Can we Recycle Glass? In addition to roadside recycling, provided by the Local Councils, we should all become familiar with glass recycling bins. These are a common site nowadays – usually available on the high street or by larger supermarkets. It is important to recycle bottles by their colour: separate bins are provided for green, clear, and brown glass. This is because colour contamination can damage the process later on. But as consumers, if we recycle all our glass products, we are making a real contribution!